Concerto for Orchestra was commissioned by the National Centre for Orchestral Studies and was first performed by their symphony orchestra conducted by Adrian Leaper (under the original title of Greenwich Dances) in May 1983. A revised version, now under the title of Contrasts – a concerto for orchestra was given its premiere by the National Youth Orchestra of Great Britain in Philharmonic Hall, Liverpool, in 1989. 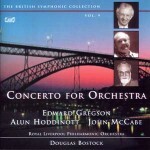 A final revision of the work was made in 2001 for the recording by the Royal Liverpool Philharmonic Orchestra, conducted by Douglas Bostock, on the Classico label. As the original brief was to write a display piece for orchestra, the final change of title of the work I have now made seems entirely apposite. The work is in three movements, and which to some extent all share common musical material. The first movement, lntrada, opens with a four-note horn call, soon joined by the rest of the brass and percussion. This fanfare-like introduction leads into an energetic 6/8 dance, the main theme of which is an extension of the opening horn call. The climax of this section is punctuated by a percussion ‘break’, leading into a slow, lyrical section, with solos for wind, which are eventually broken up by jarring muted brass. A short reprise of the first section ends the movement. The second movement, Elegy, is slow and thoughtful and is the emotional heart of the work. Its gentle lyrical core has, however, a darker edge to it and gradually moves into a central section built of chromatic clusters, eventually leading to a powerful climax before subsiding into a 12-note passacaglia theme on cellos, basses, and bass clarinet, with the opening melody now transformed into solos for horn, flute and clarinet. The movement ends in an unresolved chord on melodic percussion. The final movement returns to the dance-like mood of the first movement, this time in the form of a lively Toccata. It opens with another percussion ‘break’ but soon develops its main idea – repeated rhythmic figures in changing time patterns. A slower middle section follows where the melodic and rhythmic ideas are developed (pizzicato strings answered by woodwind, later brass). The music gains momentum again and returns to the opening of the movement, this time more assertively and with a stronger driving energy. The work ends with a short but triumphant reprise of the opening horn call. The work is scored for large symphony orchestra, with triple woodwind, piano, harp, as well as a colourful range of percussion. Edward Gregson’s [Contrasts] … impressed me with its boldness and originality of approach. … it provides big exuberant passages, full of glinting timbres, rousing Fafner-like brass, bright Stravinskian rhythms and episodes of reflective beauty.The central Elegy, which has a noble passacaglia climax, is particularly appealing. 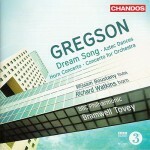 Gregson’s Concerto for Orchestra is one of his finest achievements so far. Concerto for Orchestra might imply a less-than-wholly-serious work, but that should not be inferred from Gregson’s score; it is an important piece that demands to be taken seriously.